Future prediction is one of the fascinating topics for human endeavor and is identified to be a vital tool in transportation management. Understanding the whole network of transportation is much difficult than on a single road. The main purpose of this effort is to provide a better route with high safety level and support the traffic managers in managing road network efficiently. Sameen, M. I., & Pradhan, B. (2017b). 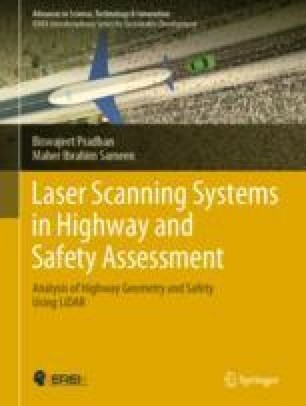 Assessment of the effects of expressway geometric design features on the frequency of accident crash rates using high-resolution laser scanning data and GIS. Geomatics, Natural Hazards and Risk, 8(2), 733–747. http://dx.doi.org/10.1080/19475705.2016.1265012. Sameen, M. I., & Pradhan, B. (2017c). A simplified semi-automatic technique for highway extraction from high-resolution airborne LiDAR data and orthophotos. Journal of the Indian Society of Remote Sensing, 45(3), 395–405. https://doi.org/10.1007/s12524-016-0610-5.